Laparoscopic surgery. The uses of non-absorbable suture in combination with pledgets, absorbable and non-absorbable mesh have been advocated to achieve low recurrence rates. We present a new technique of hiatal closure using a Quill Knotless Tissue-Closure Device suture Angiotech (Vancouver, CA). Methods: A new type of suture material that was originally developed to be used for wound closure in orthopedic and plastic surgery was utilized. Quill suture contains barbs along its length. This feature makes possible bidirectional fixation that provides distribution of the tension across the two edges of the tissue and eliminates the need to tie knots maintaining tight tissue approximation. Results: We present this innovation that demonstrates the closure of a hiatal hernia defect with a 2/0 prolene Quill running suture. The operative time dedicated to this part of the procedure decreased significantly and did not require advanced skills. 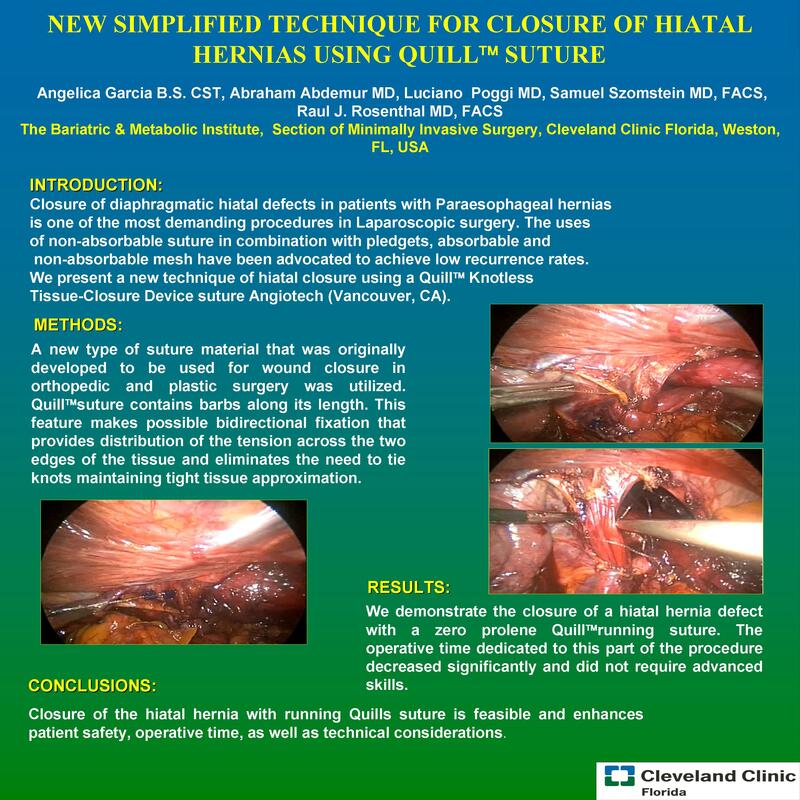 Conclusion: Closure of the Hiatal hernia with running Quills suture is feasible; it also enhances patient safety, operative time, as well as technical considerations.